Blocks of XML for broad XInclusion in other files, or for reference using the mol: private URI scheme. Hand-coloured map of London cut from 1635 edition of Georg Braun and Franz Hogenberg, Civitatis Orbis Terrarum. MAP L85c no.27 (Digital Image File 3371). Used by permission of the Folger Shakespeare Library under a CC BY-SA 4.0 license. For better image resolution, view the image in LUNA. London. 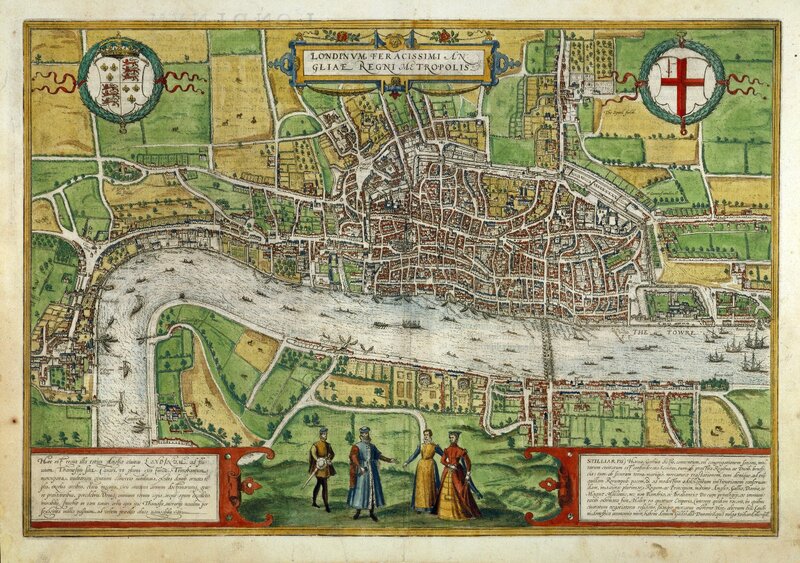 The Map of Early Modern London, edited by Janelle Jenstad, U of Victoria, 20 Jun. 2018, mapoflondon.uvic.ca/LOND5.htm. London. The Map of Early Modern London. Ed. Janelle Jenstad. Victoria: University of Victoria. Accessed June 20, 2018. http://mapoflondon.uvic.ca/LOND5.htm. 2018. London. In J. Jenstad (Ed), The Map of Early Modern London. Victoria: University of Victoria. Retrieved from http://mapoflondon.uvic.ca/LOND5.htm.